What better way to beat this heat than a steaming bowl of spicy chili? Okay, I’ll just let you know now. My cooking is as eclectic as the rest of my lifestyle – wardrobe, home décor, hobbies, music – I am all over the map. I like to think of myself as well-rounded. It is the middle of the summer & I suppose I should be eating salads & keeping things light. Well… chili sounded good. Actually my dear friend & co-worker inspired this recipe when I was drooling over her lunch instead of enjoying my own! If it is too weird, or too hot, feel free to wait a few months for cooler weather before trying it! However, I recommend whipping it up in the morning for an easy mid-week dinner. Plus, the leftovers will keep your lunches simple & healthy! I could barely wait to eat long enough to take a quick photo!! Chop onions & place in bottom of the crockpot. Heat olive oil (or coconut oil) & brown chicken adding chili powder, dried garlic, salt & pepper to taste. Add garlic to hot pan for 30 seconds. Add to crockpot. 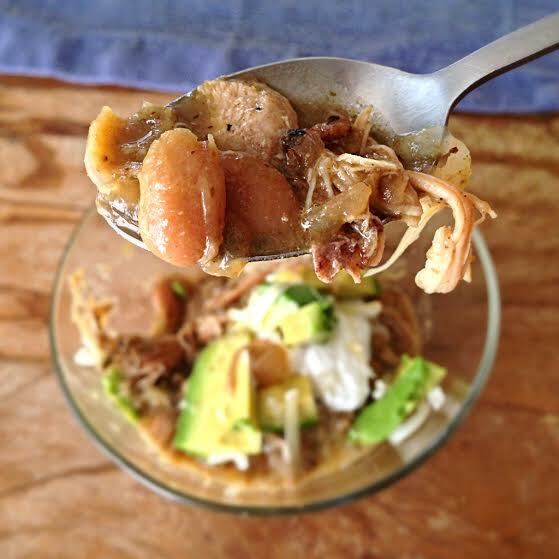 Add coconut milk, green chilies, chicken broth, beans, salsa & spices to crock pot. Stir, cover & turn crockpot on low for 8 hours. Remove chicken & shred with a fork. Stir arrowroot powder (or cornstarch) into the chili to thicken slightly. Add shredded chicken back in. 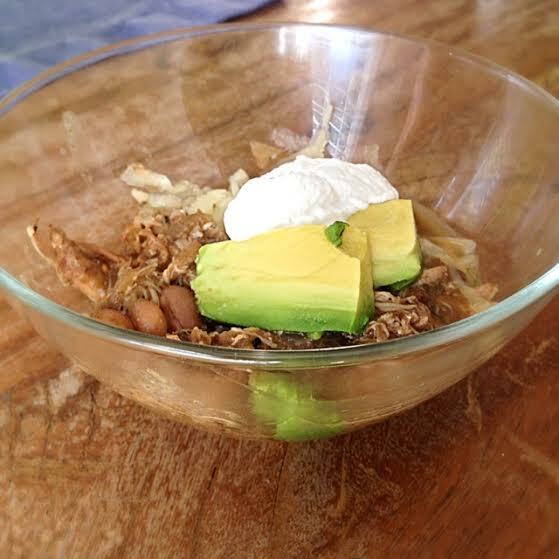 Scoop into bowl & add toppings of your choice! Enjoy!! First Bite… after smelling it cooking all day! Yum! If you try this & experiment with other ingredients please comment & share! !